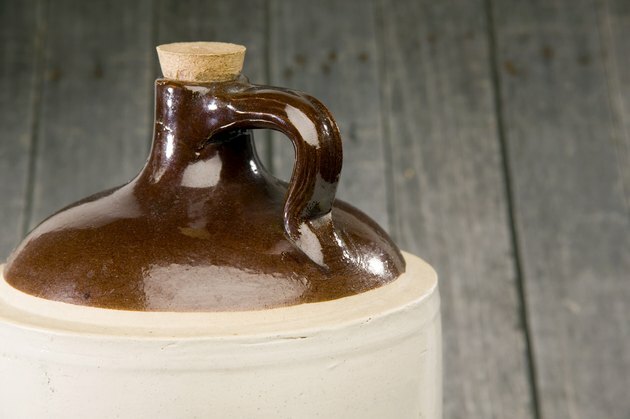 Can the Ingredients in Apple Cider Cause a Stomach Ulcer? Foods and beverages do not cause the development of ulcers. If you experience pain after consuming apple cider, you may have an underlying digestive condition. Certain lifestyle choices and a bacterial infection in the intestines are the two main causes of ulcers. The citric acid in some brands of apple cider may aggravate the open sores in the digestive system. Any symptoms that develop from drinking apple cider need to be reported to a doctor. Apple cider and apple juice are not all that different. According to BonAppetit.com, many manufacturers of apple juice market the same product as both apple juice and apple cider. True apple cider has no ingredients other than apples. The traditional difference between apple juice and apple cider is that the cider is typically not pasteurized and is left unfiltered. Consuming apple cider should not cause digestive complications. Any symptoms that develop may be sign of a more serious condition. Ulcers develop when the protective lining of the digestive system weakens and erodes. As a result of erosion, soft tissues underneath are exposed to harsh digestive acids and chemicals that cause irritation. The main cause of peptic ulcers is the presence of the H. pylori bacterium, which weakens the lining of the digestive system. Other causes include smoking, overuse of alcohol and daily use of non-steroidal anti-inflammatory pain relievers. Foods and beverages do not cause ulcers to form, but certain foods may trigger ulcer pain. The pain you experience after consuming apple cider may be related to another digestive condition. Common digestive conditions that can lead to adverse reactions after consumption of apple cider include gastroesophageal reflux disease or GERD, irritable bowel syndrome or IBS and fructose intolerance. GERD causes frequent heartburn that manifests as a burning and painful sensation behind the breastbone. IBS is a common digestive condition that causes stomach pain, cramping, diarrhea or constipation. Consuming certain foods can trigger IBS symptoms, which you may confuse with ulcer pain. Fructose intolerance is the inability to digest the sugar in fruits and fruit juices. Fructose intolerance is incurable and may require avoidance of all sugar. If you are diagnosed with an ulcer, your doctor may recommend over-the-counter or prescription medications. Antibiotics are commonly prescribed to kill the bacterium that's causing the ulcers, along with acid reducers to neutralize any acid in the stomach or intestines. Certain foods and beverages, such as alcohol, caffeine, spicy foods or highly acidic foods, can cause abdominal pain if you have an ulcer. Does Vanilla Ice Cream Soothe an Ulcer? Can Beer Damage the Throat?